this program is being reevaluated due to changes in location. …Do Not Compare to Our Immersive & Intensive Teen Programs! Heroes Academy programs give mature teens a transformative experience within intensive programs. Participants must overcome challenges on their own and with the invaluable help of other participants, including the “Heroes Journey” challenges of internal growth in the areas of accountability, leadership, honor, and planning. Join Joaquin and other RA Quest Leaders at the Heroes Academy – Empire! Formidable missions, nighttime ambushes, wayfarer inn merriment, and a monster-laden wilderness to explore! 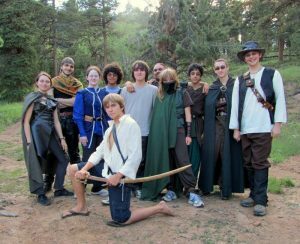 Teens band together in small groups with RA Quest Leaders, while engaging with an immersive village co-created by 20+ costumed adult live-action roleplayers. Camp in rustic cabins or tents and roleplay with rogues, sorcerers, knights, and monstrous foes! In a well-established fantasy setting, participants play a character using the NERO game system. Costumes are required at all times during the Heroes Academy: Empire weekend event. Price includes food and lodging, but not costuming. Game rules and character creation/advancement is explained the Friday night of the event.